South Carolina requires supervisors of food service establishments and non-retail food service establishments be certified in food protection. This means a person-in-charge, an owner, or manager of a food establishment – (i.e., restaurants, bars, cafes, bakeries, delis, mobile vending, food trucks, assisted-living, day care centers, and convenience stores) become certified by taking a approved food manager training course and successfully passing an accredited food manager certification exam. 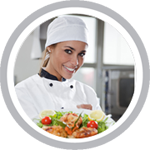 We offer online HACCP Training in South Carolina for: Columbia, Charleston, North Charleston, Mount Pleasant, Rock Hill, Greenville, Summerville, Sumter, Hilton Head Island, Spartanburg, Florence, Goose Creek, Aiken, Myrtle Beach, Anderson, Greer, Greenwood, Mauldin, Taylors, North Augusta, St. Andrews, Easley, Wade Hampton, Socastee, Simpsonville, Hanahan, Lexington, Conway, Seven Oaks, and many more!